A couple of days ago I received my first piece of terrestrial Iron in the mail, my first ever order from Kaygeedee Minerals. The business is owned and operated by Kerry Day who expediently sent me the Iron; a small fragment of massive Antimony was also included free of charge! I was pleased with Kerry’s service, so I will continue to watch his website… I am glad to finally have some native Iron for my Iron Suite. 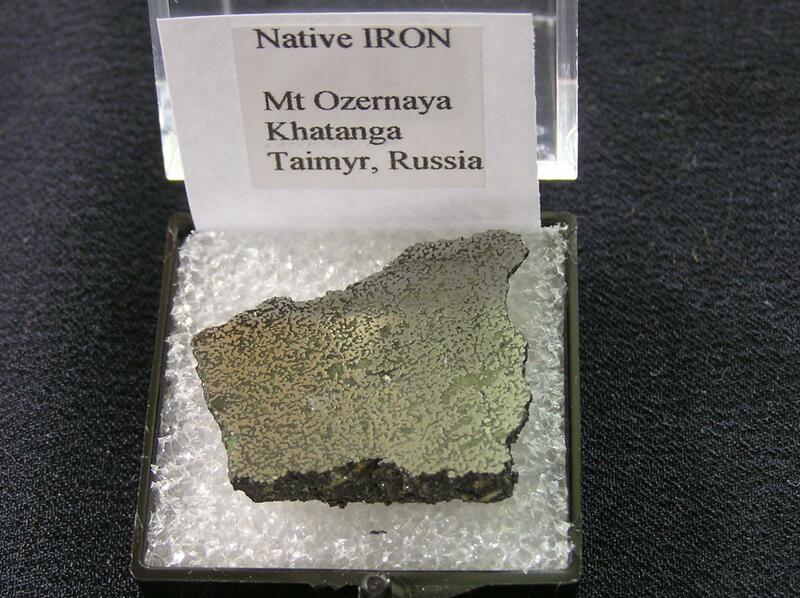 While this specimen hails from Taimyr, Russia, I also look forward to getting some Iron from Disko Island, Greenland..! To at least some extent it appears that most self respecting Rock Hounds build up their collections by going to a mine or some such site to dig up their own specimens. The very name “Rock Hound” suggests this: tracking elusive crystals to their lair and ferreting them out with hammer and chisel. Upon uncovering an exceptional find Rock Hounds have been known to howl, or at least yelp with excitement… The unearthed specimens are carefully gathered up, to be cleaned and prepared for display-a great source of pride for the Rock Hound. This is the joy derived from specimens being Personally Collected, and specimen labels, catalogues, or the like should always indicate this. I say “personally collected” not “self collected,” which is what I sometimes see written on labels or photo captions, etc.. As with the misuse of “its” and “it’s” or “their” and “there” my inner grammarian also flinches when I see “self collected,” which suggests the specimen rolled towards the collector and jumped into her/his pocket. While I like to think that every specimen might have a certain “personality” or”character,” I think a rock with enough free will to voluntarily join someone’s collection is a bit of a stretch. Like admitting a dirty secret I must confess that there are currently no specimens in my collection that I have personally collected. There are some specimens that have been “personally collected,” but it wasn’t by me. I have only once been to a collecting site: I was a kid and not very interested in rocks and minerals at the time. My uncle took my cousins and I to some cave-like place somewhere in Ontario; I can’t remember what it was called or exactly where it was. I only recall seeing a lot of white chalky rocks and boulders and we were supposed to be looking for some bluey mineral, I think it was Sodalite… In any case I have not been on a collecting trip since. Without the experience of collecting in the field perhaps I’m not much of a Rock Hound after all… Can one only truly know a mineral species when one personally undertakes the hunt? Most of my specimens have been purchased from a number of mineral selling websites that I regularly visit; the rest have been procured from stores, rock and gem shows, or received as gifts. I use on-line purchasing almost exclusively as I find it to be the most efficient and reliable way to browse a wide selection and obtain ideal specimens. So while many Rock Hounds have toiled over a crevice or conceivably risked being buried alive in a mine somewhere, I have slaved over a computer while sitting comfortably indoors, to secure the specimens that appeal to me. I am rather selective of which websites I buy from, at the moment my main on-line shops are: John Betts Fine Minerals, Dakota Matrix Minerals, David K. Joyce Minerals, and a very few others. Purchasing minerals in person at local speciality shops isn’t really an option as I often find that condition, specimen information, and overall variety remains rather poor. Hopefully this will change someday. Although I don’t doubt that there are rock and gem stores out there somewhere with an excellent selection and level of care towards their specimens, such boutiques are not within my immediate area… Of course, what is junk to one person can be a treasure to another. While I seek specimens that are free of damage and properly labelled, there are many collectors out there that don’t concern themselves that much with the condition or documentation of their specimens. I suppose I’m picky. I would definitely be interested in collecting minerals in the wild, but as yet the opportunity hasn’t presented itself. I am aware of some of the classic localities for uncovering the earth’s treasures. I’d love to visit Searles Lake or Sudbury’s Broken Hammer, or the Kalahari manganese fields… I’d prefer to go on a Rock Hounding trip with someone suitably experienced, but apart from my Uncle there is no one else in my family or peer group interested in mineralogy. I guess it behooves me to join some local rock and mineral club/society… I also feel that if I were at a collecting site I wouldn’t trust myself to be able to find perfect, damage-free specimens. Even now when I look at a crystal through the loupe I’m still not sure if I’m seeing a chip or a natural growth hillock. I am hoping that continued experience will develop my discerning eye. While I may be missing out on one of the basic joys of Rock Hounding, I am quite happy to obtain my specimens over the internet. When the time comes to go collecting in the wild I will have to get myself the tools of the trade: a rock hammers, chisels, pry bars, safety hat, goggles… I’ll probably buy them on-line. In the meantime, to all the true blooded Rock Hounds out there: enjoy the hunt!